This app is my favorite numerology app. There’s a lot it offers, it’s so easy to use, and it’s mostly “uncanny” in its predictions. The numerology app is more thorough than most. 33 keeps reducing to 6. Almost flawless, needs info on day of birth. I love this app. It gives you a lot of detailed information about your personal Numerology. So easy to use. Love it. This app is so accurate that it's scary, in a good way! I like how I can put all my friends in and new people I meet! I wish it was more in depth with explaining the numbers but it is a very useful tool! I am glad I purchased the app. Good, but could use some attention. I really use this app for the calculations, which are very accurate. I wish the content was a little more varied and detailed, because I've been reading the same descriptions on the days/months/yrs for as long as I've had it...at least a couple of years. I sometimes reference this for the numbers and consult a more detailed book for better descriptions. Overall, it's been helpful. I totally love the app! Could there be more features, I've read some articles how numerology coincides with death, using ones birth time if known, and finding your true love! Could you look into it, please! Not sure exactly when I've discovered numerology, but it's never been wrong, and has been completely helpful in my life. Truly, NEVER been wrong. I purchased this app years ago, and noticed it wasn't available for sale for quite some time. It's great for doing the math instead of sitting there a=1, b=2, etc... Incredibly helpful for a quick reference to explain to those who think I'm bonkers lol. I've gotten to a point where I can assume what numbers people have in their charts. Odd hobby, I guess. From celebrities to infamous murderers just to get an idea of how their minds work. Again, odd hobby. Definitely recommend this so you know what personality you're dealing with. Easy to navigate & understand - especially for those just beginning to explore numerology. Love it! Very informative,, I use it all the time..
Clean, basic little toy without much depth, fun o read from time to time but repeats itself too often. 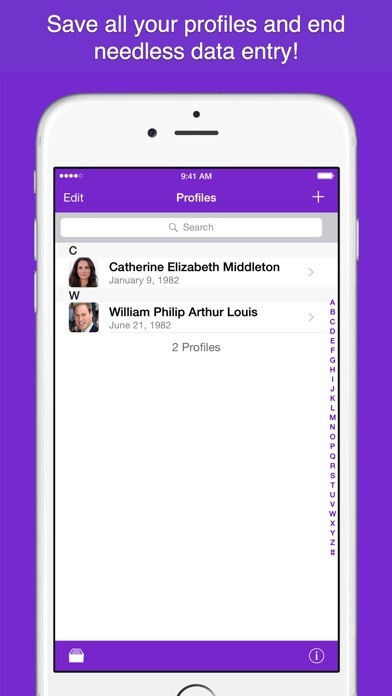 This app is simple to use and offers a quick snapshot of your day, as well as compatibility with others... Nice! This app is great just for the fact that it does all the basic calculations for you. 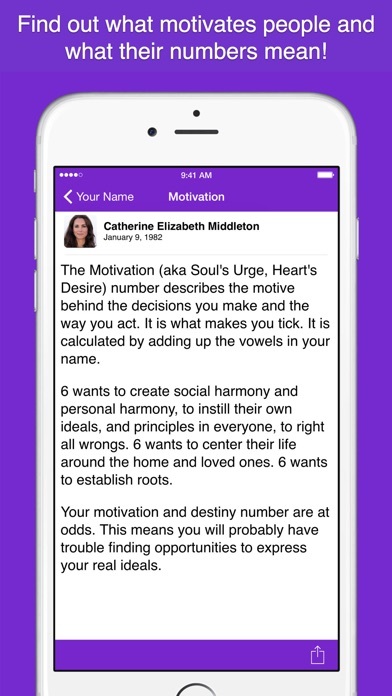 I wish it went more in depth because it is the best numerology app I have found so far. This app predicts pretty close to what has happened in daily life to me over the last year. I like seeing what the future has in store. 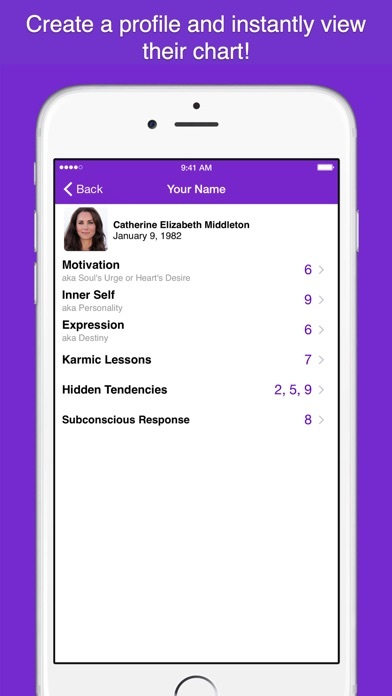 This app is a great quick reference to basic/intermediate numerology. I've had this app for years. It was great. 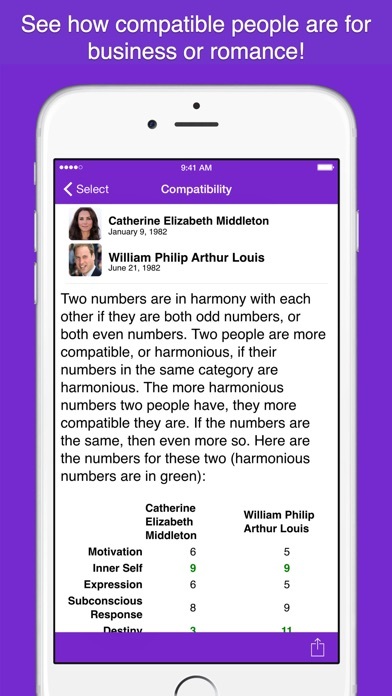 You could play with compatibility, see how you and your partner relate. 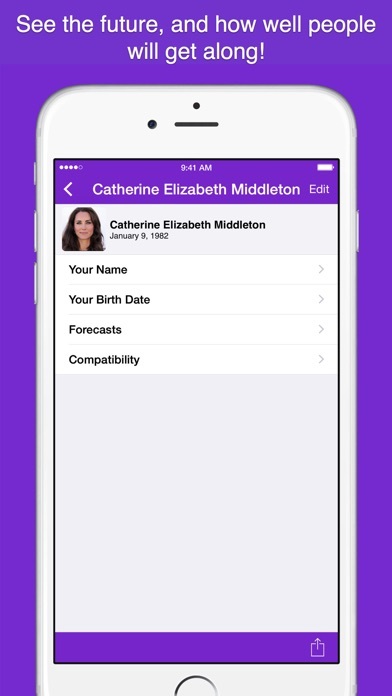 You could also make corrections in the name/Birthday and see how forecasts change. No longer these features are available. Seriously! You can't even edit the misspelled name. I am deleting this app. I have been using this app for a couple of years now. I love it! Not so happy with this app at all! I have the paid for version. All the forecasts are really monotonous! Seem way to similar to each other and it just repeats the same ones over and over again ALL the time for almost a year now! I study numerology and use this sight often; I find it totally accurate. I am a numerologist and the ability to have accurate calculations accessibility on my iPhone it's great. Info is accurate and easy. A keeper! Not crazy about the way it calculates compatibility but I like many of the interpretations and forecasts. I love this app. I check it daily. I only wish there were even more details and info on here. I wish I could change it to Chaldean, which is more accurate. If I could, this would be the best thing ever. I understand many like Pythagorean, and if you do, this is for you. For my preferences Chaldean is the better numerological system but both are used and respected, it is a matter of preference. I use this app in my practice for every consult. Saves me time and gives more info than I would calculate on my own. I love having all my clients' chart numbers saved and always available. Definitely great for business. So badly want to give 5+ stars since I absolutely adore this app, however this new update to help with crashing is CAUSING crashing. Please fix immediately!! I LOVE this app. Makes things so much easier when doing readings. And it's easy to navigate and easy to read and follow. Glad I downloaded this one. This is extremely accurate . I would change only one thing. I believe that the 7 vibration is raising so I believe that the "y" should have the 7 vibration so I change spellings to get that vibration. It is considered a vowel ( with a 7 vibration )always in my calculations. Love this app! it's precise, very accurate! Excellent date. I use it a lot. New update is causing a crash every time I try to access forecasts. Otherwise very enjoyable app. I like the app. It is good as a basic intro to numerology. Use it constantly for every headline in websites I make. very thorough with the 'compatibility' etc pieces. THANKS! Easy to use & accurate. Crush al the time. It does not work at all. Love it. Helps day-to-day with family and their focus (oh! So THAT'S why she/he's so quiet today.) Fun to look up future priorities too. The updates have been great as far as functionality is concerned. Content however hasn't changed at all. It functions sort of as a numerology directory for people you know, the analysis is pretty much unvaried. I suggest adding calculations and info. Ie maturity number, birthday meaning. Compatibility isn't complete without the maturity number. The app NUMBO is a great one, not as functional but is a bit more informative. I'd really love to see this app improve. I'd even pay for a substantial update. Had this app for years -really enjoy it. Love the ability to email reports.